At Learning Zone daycares in Murfreesboro TN, we are passionate about the importance of community. Not just our community of parents whose children attend Learning Zone, but the larger community of Rutherford County. When we relate to people in our community in a very positive way, we feel more connected, more satisfied, and more fulfilled. Of course, you can’t truly know everyone in your community. However, you could relate to all those you meet with a smile, with kindness, or a helping hand. In the month of February, Learning Zone preschools in Murfreesboro, TN kicked off a company-wide event that gave us many opportunities to love on our community helpers, our families, our students, our staff, and the less fortunate. So, as part of this event we chose two organizations to support: PAWS and Green House Ministries. Green House Ministries offers services for basic human needs. The goal of Green House Ministries is to provide “a place to help, educate and connect everyone who walks through the door.” Green House Ministries helps people in need through its food bank and by providing clothing, toiletries, household items, and prayer. Our parents and staff donated generously. 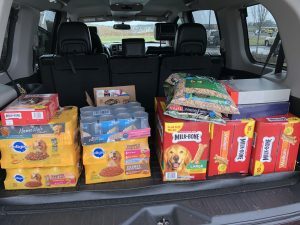 Donations included pet food and toys for the animals at PAWS and canned goods and toiletries for Green House Ministries. We received those donations with much gratitude. Both the givers and the receivers were greatly benefited. And the level of connectedness in the community went up a notch or two. If you are searching for the best preschools Murfreesboro TN has to offer then consider Learning Zone of Murfreesboro. We truly care about you, your child, and oour community, consider Learning Zone. Give us a call at 629-207-3131 (Blackman Preschool) or 615-546-5410 (Siegel Preschool).